The second realm is the Heaven of the Thirty-three Gods (Trayastrimsa) which is placed on the summit of Mount Sumeru. The most important god of this realm is Sakra (or Indra in some texts). As Master Genshin explained, “a hundred years of human life are equal in length to one day and night in the Heaven of the Thirty-three, and in this heaven life lasts a thousand years”. The third realm is the Heaven of Good Time (Yama or Suyama). As Master Genshin explained, “two hundred years of human life are equal in length to one day and night in Heaven of Yama, where life lasts two thousand years”. The fourth realm is the Heaven of Contentment (Tusita). Queen Maya, the mother of Shakyamuni Buddha was reborn there when she died, seven days after giving birth to Him. 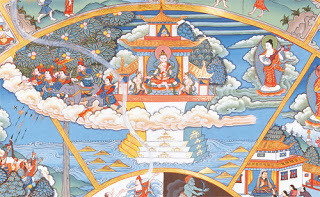 During His earthly life, Shakyamuni often made visits to this realm (and other heavenly realms, too) in order to teach the Dharma to His mother and the gods living there. As Master Genshin explained, “four hundred years of human life are equal in length to one day and night in Tusita, and in this heaven life continues for four thousand years”. The fifth realm is the Heaven of Enjoyment of Pleasures Provided by Themselves (Nirmanarati). As Master Genshin explained, “eight hundred years of human life are equal in length to one day and night in Nirmanarati, where life lasts eight thousand years”. The sixth realm is the Heaven of Free Enjoyment of Manifestations by Others (Paranirmitavasavartin). This realm is inhabited by Maras, which are celestial demons that usually go to the other worlds to obstruct practitioners from advancing on the Buddhist path. So, “Mara” in Sankrit language means „evil one”, „adversary” or „tempter”. Their karma accumulated in past lives was good enough to make them reborn in this high heaven, but still, their lust for power and selfishness not being eradicated, transformed them into living obstacles for other beings. Thus, they do everything in their power so that nobody gets higher than their plane of existence. The Nirvana Sutra lists four types of demons: 1) greed, anger and delusion; 2) the five skandas, or obstructions caused by physical and mental functions; 3) death; and 4) the demon of the Heaven of Free Enjoyment of Manifestations by Others (Paranirmitavasavartin). So, in the Buddhist texts the word “demon” is sometimes used with the meaning of internal demons, or personal blind passions and illusions, but also in the sense of an actually existing being or beings who disturb others from reaching freedom from birth and death. Nowadays, there is a common mistake among many so called “modern” Buddhists, who promote the idea that maras are only internal and not external demons, too. Please do not share their misunderstandings, and single-heartedly entrust to Amida Buddha, which is the best way to be protected against the influence of such evil and powerful beings. As Master Genshin explained, “sixteen hundred years of human life are equal in length to one day and night in Paranirmitavasavartin heaven, in which life lasts sixteen thousand years”. 1. There are beings whose objects of desire are placed (by outside factors) at their disposition; but they are able to dispose of these objects. These are humans and certain gods - namely the first four classes of gods. 2. There are beings whose objects of desire are created by themselves; and they dispose of these objects which they create. These are the Nirmanaratis. 3. There are beings whose objects of desire are created by others but who themselves dispose of these objects created by others. These are the Paranirmitavasavartins. This means that the one who is reborn among the gods of the World of Desire cut many other passions from his heart, but still remained with various forms of lust, while those who destroyed lust but still have other more subtle delusions, go to the next heavenly realms in the World of Form (Rupadhatu) or World of Non-form (Arupyadhatu). The world of form is the effect of great meritorious deeds and strong meditation practice, while the world of non-form, where beings do not posses bodies of form, is the effect of high levels of samadhi (meditative concentration). The gods of the Rupadhatu (World of Form) and Arupyadhatu (World of Non-Form) have an extremely long life in comparison with humans and gods of Kamadhatu (World of Desire), while also lacking the negative emotions from there. However, they still experience ignorance and delusion because they have not yet eliminated the belief in the false ego. By not eliminating the belief in the false ego their suppression of negative emotions is only temporary because such a belief and attachement/identification is the very root (the origin) of those emotions. Thus, they still possess the seeds and inclinations to manifest them again in the future and so the gods in Rupadhatu and Arupyadhatu may again fall in the lower realms. We must bear in mind that untill the root of negative emotions has been completely destroyed by the realization of perfect Enlightenment one cannot attain liberation from samsara. Some Brahma gods from the first Dhyana Heaven in the World of Form may experience the illusion of being all-powerful creators of the universe. About this kind of delusion brought upon them (and upon human beings who believe in them) by Maras, I discussed at lenght in the chapter "There is no supreme god or creator in the Buddha Dharma" from my book, The True Teaching on Amida Buddha and His Pure Land. Please read it carefully as I gave there many quotes from Shakyamuni Buddha himself. No matter what sensual pleasures the gods in Kamadhatu experience, they will also die when the karma which brought them into their realms is exhausted. It is said that the suffering of dying in the realm of the gods is greater than in any other realm. Why is that? To die in the realm of hells or pretas means to be released from those spheres of extreme pain and a chance to be reborn in higher places, but who would really like to abandon the most beautiful realm filled with intoxicating pleasure and hapiness, where one has a perfect body and everything his heart desires? As fuel for the fires of the Hell of Ultimate Torment." The suffering of dying there is even greater than that. Attachments for the perishable heavens." An unaccustomed sweat breaks out over their bodies. That foretell death for humans on earth." Even if the signs that fortell the death of gods may not seem extraordinary at first reading, please bear in mind that until those signs appear, their bodies were always fresh and healthy for many thousands of years, never smelled bad, never produced sweat, etc. So, its one thing to be human and have the above problems all the time, and another to live happily like a god for many thousands of years in which only one minute of their life may be a hundred years of human life, and suddenly experience the five signs of death. And it is said in some texts that the time before dying, in which the gods experience the five signs and contemplate their falling into the lower realms, also lasts many years. During this time all the other gods leave them completely alone, being disgusted with the sight of their decay, and so the dying deity suffers enormously. “Even though the pleasures of these beings are boundless, when life comes to an end they cannot escape the pain of the Five Decays. The first is the fading of the crown of flowers. Second, the heavenly weather clothing becomes soiled. Third, sweat flows from the body. Fourth, the eyes often grow dizzy. And fifth, the place of living no longer gives enjoyment. These are called the Five Decays. "They must take leave of the divine worlds. Animals, hungry ghosts, or denizens of hell." Depending on the merits they acumuated in previous lives, the gods in the World of Desire receive various pleasures and desirable objects. Thus, some have more than others, which causes those with lesser merits to become anxious and suffer. Because of the wars they fight with asuras (demigods) they are often hurt in many ways. However, whenever they are injured their body parts regenerate with the exception of the head, as gods in the World of Desire can be killed only by cutting their heads. Some weaker gods are often banished from their places by the more powerful ones. Sparked by the infection of sensual desire. For those whose minds are distracted? They are by nature disturbed and agitated. And that rages, whipped by the wind." From an illness, who eat improperly and get sick again." The gods in the World of Form (Rupadhatu) and World of Non-Form (Arupyadhatu) do not experience the sufferings of the deities in the World of Desire, but they also die while still having subtle afflictions and osbscurations. As I said previously, they have not freed themselves from the belief and attachement to the false ego, so the root of negative emotions is still there even if they kept them hidden by being immersed in meditative absorbtion. Thus, not being liberated from samsara, they have no control over the course of their future karma and when the reservoir of merits that brought them in those high celestial abodes is exhausted, they fall again in lower realms. Are beyond the suffering of pain and the suffering of change. They remain motionless for an eon. After they have counted on it, they will again fall. They will fall back down in the end. Abhidharmakosabhasyam, English translation by Leo M. Pruden; Berkeley, Calif, Asian Humanities Press, 1991; vol 2, p. 465-466. The gods of the next sphere – the World of Form (Rupadhatu) are complete in their development from birth and are also born fully clothed. Maha-prajna-paramita-sastra, Lamotte, volume 3, p. 1162. Letter to a Friend, as quoted in The Great Treatise on the Stages of the Path to Enlightenment, volume I, by Tsong-kha-pa, Snow Lion Publications, Ithaca, New York, p. 293 - 294. Trāyastrimśa is Toriten in Japanese. He gives that example on the basis of the Sutra of the Six Paramitas (Roku-haramitsu-kyo). This sutra was also named Dai Rishu Ropparamitta, Ropparamitsu-kyo, or Liu-po-lo-mi-ching in Chinese. It was translated from Sanskrit into Chinese in 788 by the monk Prajna. Teishaku is Sakra (Indra), the ruler of the Heaven of the Thirty-three Gods (Trāyastrimśa). Shushoden and Shushaen, Zorinen, Kwankien, Goba tree, Shushochi are places and various elements of the Heaven of the Thirty-three Gods. Shakuten is the same as Tesihaku (Sakra/Indra). Gods in the World of Desire (Kamadhatu).